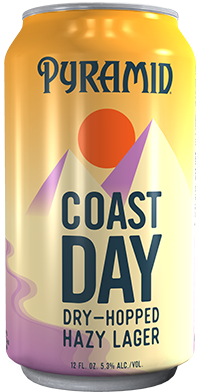 Coast Day | Pyramid Brewing Co. Brewed with long-summer days in mind, this hazy pale, straw-colored lager will be available to enjoy year-round exclusively in 19.2 oz cans. “Coast Day could not make its debut at a more perfect time,” said Head Brewer Ryan Pappe. “This beer’s crisp, refreshing flavor profile embodies summer. 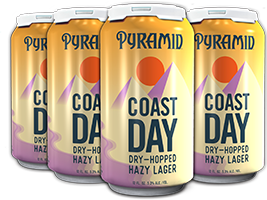 Whether you plan to enjoy it on the side of a mountain or poolside, it’s the perfect accompaniment for summer fun on-the-go.” True to its Pacific Northwest roots, Pyramid Brewing Co. sourced the finest regionally grown ingredients for brewing Coast Day Dry-Hop Hazy Lager. Brewed with a unique blend of Nugget, Liberty, and Mount Hood hops and dry-hopped with Experimental Hop 09326, plus Centennials for extra flavor, Coast Day is a full-flavor, full-bodied beer that features tastes and aromas of citrus and berry.